Kite flying is a Spring pleasure in India and Pakistan. YOU wouldn't think that a public festival in Lahore goes by the name Basant. A Hindu name for a public holiday in Pakistan? One which falls on more or less the same day as Basant Panchami in India? Yes it is. Basant is one of the biggest festivals on the Lahori's calendar; a mammoth social occasion that does not revolve around a religious ritual but around putting thousands of kites into the sky. The sight of a whole city caught up in a "Basant" frenzy startles an Indian ignorant of customs and traditions in Pakistan. 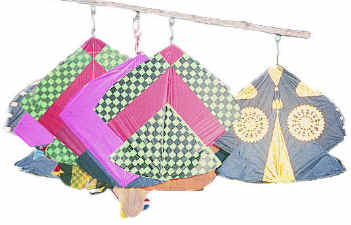 Ahmedabad has its kite flying ritual in January on Makar Shankranthi. Other Indian cities and states too have their annual seasons, if not particular days, in which kite-flying is a big event. But none is likely to match the scale and fervour of Lahore on Basant day. Like in North India, Basant in Pakistan's Punjab is a spring festival. It heralds both the approach of the harvest and the end of winter. This year the festival was celebrated on February 17, but Lahore began its party the night before in the walled city. The real celebrations took place the next day. The Lahoris' involvement in Basant is like our involvement in Deepavali. The big difference is that in Lahore's Basant, kites replace crackers. From the morning onwards, the roofs of Lahore were full of young and old keeping their kites afloat. By early afternoon, the sky was peppered with kites of different colours. They come in different sizes as well — some have to be transported on the roofs of cars, others are small enough to be carried on bicycles. Yellow is the predominant colour. "This is the colour of the mustard ripening in the field," says a gracious Lahori host, as he drapes a yellow dupatta on the shoulders of each visitor. The fun of Basant does not preclude the intense competition that is a uniquely south Asian phenomenon — cutting each other's kite lines. Like in India, manja is used to give that "cutting edge" to the twine and each time a kite's life-line is severed, a cheer, "Bo-Kata", (loosely translated as "a kite cut off") is sent up by the victor. The beauty of Lahore's Basant is that every one — rich and poor — can enjoy it since all that is required is a kite and a ball of string. The wealthy Lahoris may have their huge kites with intricate patterns, but in the end a kite is, well, a kite. By evening, the overhead wires are dotted with kites which have been trapped during their flights. So many are sent up that in certain areas the regulators have to suspend power supply to save on possible short-circuiting of the electricity lines. But tragic accidents do happen, like this year when the papers reported that six people died, either because they fell from the rooftops or died from electrocution. "We in Lahore have over the years taken to Basant and kite-flying," said an elderly Lahori, "while for some reason Amritsar has given it up," referring to the rather lukewarm celebration of Basant in our Punjab. Lahore's Basant is such a social event that it attracts people from the rest of Punjab even from as far as Karachi. The popularity of this Lahori festival has grown so much that other cities in Pakistan too have started to organise their own versions, "copy-cat" Basants as a parochial Lahori will tell you. For the wealthier Lahori, Basant is not just about flying kites. It is also a time to get together, to host family and friends and to celebrate with a lavish meal. The growing popularity of Basant has naturally meant the entry of corporate hospitality. Companies host their guests on Basant even by "renting" roof-tops in the walled city at exorbitant rates for just the evening. The inevitable question on the mind of a visitor from India is how have the Lahoris taken to an event whose name suggests that it is a Hindu festival, even if there are no religious rituals to accompany it. The answers you hear are interesting. Some see the public embrace of a secular Basant as a way of striking back at the fundamentalists who want to constrain their lives. Some say that during the Zia years of the 1980s there was a stifling of celebrations as it was labelled "a Hindu" festival. Even later, Nawaz Sharif, who was beholden to the religious right, was less than open about his visiting social events on Basant. The near frenetic celebrations of Basant today are seen as a reaction to past controls. And yet others perhaps rightly tell a visitor from India that Basant does not belong to the Hindus or the Muslims. "It is a festival of Punjab. You in India may not be too excited by Basant. But for us in Lahore it has become a passion." The extremists among the mullahs have not given up. Every now and then they still raise their voices about this "Hindu" in recent years. This year there was even a suit filed in court seeking a restraint of public celebrations! Fortunately, the petition was allowed to collect dust. For now, Basant has taken root across the border. These come in different shapes and sizes and names - Gudda [ the male, normally the heavier fighter kite ] , Guddi [ the female kite], Patang, Tukkal, Chagg, Pari, Do-Akhal , Lepo , Rocket, Parphara- are just some of the different types of fighter kites from India & Pakistan. 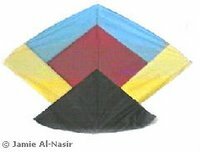 Kites are made traditionally from rice paper [tracing paper] of various thickness. Rice paper kites originated in China & Japan. These days people in South Asia are beginning to experiment with newer materials such as Nylon, Teflon, Orcon, Icarex or Mylar . The kite spines & bows are traditionally made from Bamboo strip. However, with western countries participating in south Asian kite fighting festivals, new materials for kite-spines /bows have been introduced such as graphite, carbon, etc. The line or thread is specially prepared with a paste called "Manjha" [In France there is a Kite Fighters Club by the name of Manjha International Club]. Manjha is a secret paste made from eggs [to provide the stickiness], wet flour or boiled rice as glue, finely ground glass, glue, color, and a few other ingredients. 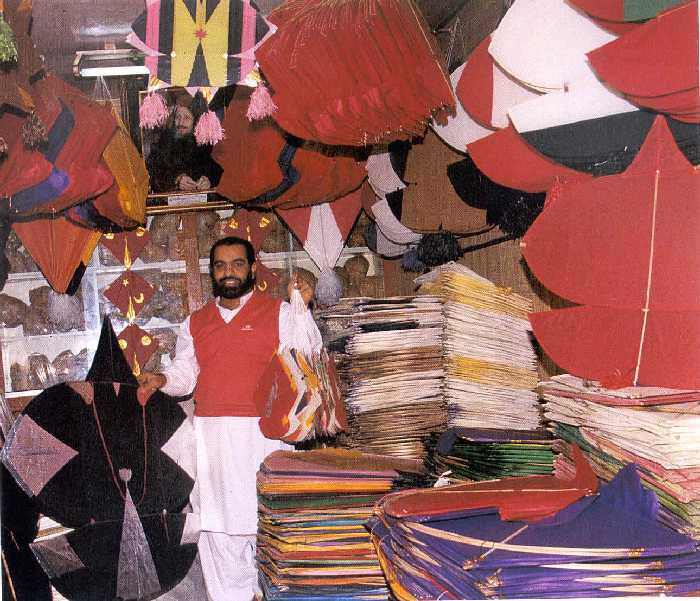 Normally prior to the Basant festival, one can often see this thread for kite fighting being prepared on the streets around Lahore or Ahmedabad - the two major kite fighting or Basant centers in South Asia. Fighting Kites involves a tangle with the lines, which are controlled by the kite fliers. The line is called "Dori" which has been applied with the "Manjha" and as such is very sharp and can cut another line or dori. It can also result in cuts to the fingers and hence kite fighting involves protecting your fingers carefully. The origin of the word Dori is curious ; it may have had its origins from the Portuguese word "bidoro" for glass. In Indonesia there is a similar word for the kite line/ thread. The Portuguese traders may have brought the kite fighting sport to Japan via Indonesia from India and the Japanese fighter kites [ the Hata or the Buka] look very similar in design to the India Gudda Kite. The dori is usually wound over paper balls and another person usually assists in winding or releasing the dori. In India and Bangla Desh, kite fliers also use a spool [ called charkhi in India & Pakistan and natai in Bengali] made from wood or bamboo to roll the dori. The Pecha involves a series of "pulls" or "releases" of the line flying the kite. As the kite weaves and dives and serenades in the blue sky the lines are busy cutting each other until finally the stronger line cuts the other kite’s line . This is the moment when the shouts of "Bo-Kata" or "Woh-Kata" literally meaning "there it’s cut ..." or "knock-out" . Once the kite is cut, there is a free-for-all chase of looting the kite that is cut [this is called "guddi lootna" . It involves carefree urchins running into the streets , or on roof -tops armed with bamboo or a stone attached to the dore. The idea is to grab the trailing kite line that is floating downwards to the ground from the sky. In Lahore the more desperate kids will use steel wire to get at kites that are cut . The result is frequent [1500 power cuts on a peak day] electricity power breakdowns over all parts of the city. There is an award called Mr. Lutiara given to a person who loots the most kites. Basant, an annual kite-flying festival in the Pakistani city of Lahore, is a spectacular tradition. However, the practice of some Lahore kite-flyers to coat their kite-strings with ground glass or metal filings to cut other kites loose in mid-air can be lethal. This year, the Lahore authorities banned all kite-flying after several people were killed in the run-up to the festival. We speak to the mother of four-year-old Shayan, who was a passenger on his father's motorbike, when they ran into a kite-string. She tells Outlook the disturbing details of what happened, and we talk to a local kite seller about the impact the ban's having on his business. ***** . Basant Panchami - ਬਸੰਤ ਪੰਚਮੀ in Punjab . dotting the sky. . .
here is some haiku of kite flying in jaipur on 14 january when the kite fliers are in their element in the city ,atop terraces, shouting and enjoying the hundreds of kites flying.